Never make deals with witches. Five hundred years ago, Edward Solomon made a deal with the crone of Hollow Woods. He was never quite sure what happened that night. He intended to get all of her lands, but he walked away with a contract in blood for only some of her lands, an agreement to deliver her anything she wanted, a promise of eternal life and glory, and a warning to never enter Hollow Woods again. The crone’s demands were always odd and started becoming oddly specific. Four freshmen from the Alpha House Fraternity she established at the entrance of Hollow Woods were to be sent to her every Halloween night. The four new Alpha House recruits - Davarius, the football player; Nakata, the basketball player; Vincent, who is there on merit scholarship; and Ashton, who was given a special scholarship for being an orphan - are all sent into Hollow Woods on Halloween night with only flashlights and stories of the crone that haunts Hollow Woods. They are all sure this is just another hazing ritual the fraternity has thought up. None of them know what to think when they find a bonfire in the middle of Hollow Woods with the president of Alpha House and three senior members around the fire with a beautiful, naked woman they introduce as the crone of Hollow Woods. She certainly doesn’t look like a crone, and she has other things on her mind Halloween night besides stealing souls and witch curses. 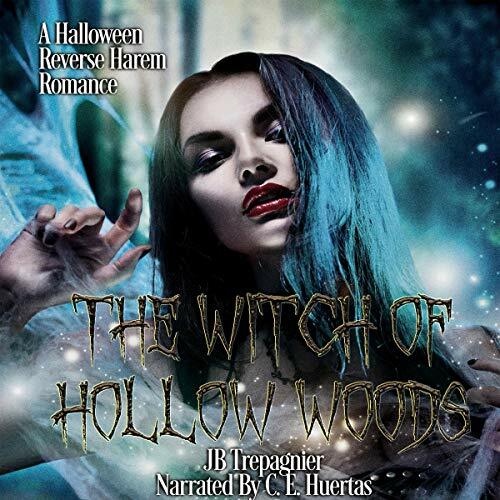 The Witch of Hollow Woods is an 11,340-word reverse harem short story with a few wicked twists inside. Well written, but had some areas that could have been improved. The narration could have been more expressive, but otherwise it was good. Okay the story was pretty good. Unfortunately the narrator ruined it. She missed pronounced words. Her trying to use different voice syntax was horrible. It took so much away from the story. Glad it was only an hour.